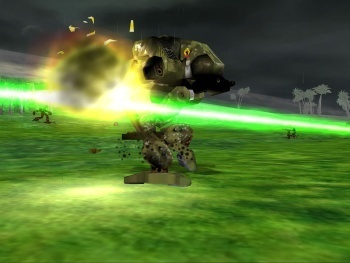 Demand for the free release of Mechwarrior 4 has brought the Mektek website crashing down, but the game is still available via BitTorrent and instructions to get it all working have been posted online. The planned free release of Mechwarrior 4: Mercenaries has not gone smoothly. First, the whole process was hung up by Microsoft, which had the unfortunate side effect of putting serious financial strain on Mektek, the group behind the giveaway. When the release finally did go ahead, the Mektek website was able to keep up with demand for, oh, about a half-hour or so. "Within 4 hours of the launch MekTek.net had received more than a 100,000 unique hits from around the globe," according to a message posted on Battletech.com. "As the demand reached 10,000 simultaneously downloads, even the heavy-duty server couldn't stand up to the demand and it, along with the website, have crashed. Through several reboots the server continues to crash as the demand still remains in the stratosphere." The Mektek crew is working to get the site back up, but at the time of writing it was still unavailable. Fortunately for fans of giant fighting robots, there's a Plan B: Dwell On It has posted a link to a torrent of the 1.8 gb MTX file and, more important, a guide to making the whole thing work. It's a fairly simple three-process: First, rename the "mechwarrior4mercenaries.all.to.51.03.01.0017.mtx" to a .zip extension, then unpack it to the location of your choice, and finally go here and read the rest of the instructions. Okay, maybe it's not quite that simple, but if you're serious about playing Mechwarrior 4 then you probably won't find it too intimidating. On the other hand, if this kind of dicking around doesn't really appeal to you, patience will eventually get you where you want to go: This process is simply a method of manually performing the tasks that the MTX distribution system does automatically, so once Mektek comes back online it'll handle most of the grunt work for you. Cross your fingers and keep an eye on Mektek.net for signs of life.